TROYE Sivan showed he was a caring sharing kind of guy when he invited lucky fans who had missed out on tickets to his sell out show in Glasgow at the weekend. The South African-born Australian singer, songwriter, actor and YouTuber met some fans as he popped out for a Starbucks and a shopping trip on Sauchiehall Street and put them on his guest list after hearing they were unable to get prizes briefs for his sold out QMU show. 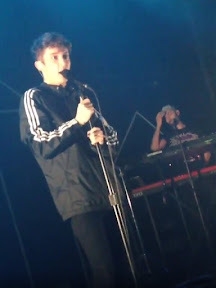 The twenty year old star was met by screams as he played his first ever gig in Scotland at the weekend on his Blue Neighbourhood tour - and he even attempted a Scots accent. Troy who featured as a young James Howkett in X-Men Origins: Wolverine thrilled with his cute charm and self penned songs like For Him, Fools, Youth, Too Good, Talk Me Down and Ease. He told the crowd it was only his third or fourth day in Europe and that he apologised if his pants were falling down - because he's forgotten his belt. No one seemed to complain. After hearing the chants of here we f***ing go, he told the audience: "When I go to other places I'll be like, do you know what Glasgow said to me? Why can't you guys be as cool as Glasgow was?" He even managed to try his hand at the local patois by saying: "Are you coming oot on the town to get mad wi it?" Troy entertained and stayed at the Glasgow Uni Queen Margaret Union till the wee small hours after his gig. After seeing him in the flesh no one needed to take a Happy Little Pill.